Mercure Raphael Hotel Wien enjoys a quiet and central location in the heart of Vienna. Situated close to Mariahilferstrasse, our hotel is ideal for culture and shopping, and a variety of restaurants is also nearby. Attractions such as the Hofburg Imperial Palace, State Opera House and Schönbrunn Palace are easily accessible. Viennese charm in a cosmopolitan atmosphere: We want to make your stay with us a special experience. Take us at our word - we look forward to welcoming you. Our hotel is the ideal starting point from which to visit museums and take to the shops. Immerse yourself in the traditional imperial Vienna or plan a musical visit to the Raimund Theater, located directly opposite the hotel. 78 spacious guest rooms in the Standard, Privilege and Studio Suite categories await you. Subtly elegant with a contemporary style, all rooms include free WIFI and tea and coffee-making facilities in addition to the classic facilities of a 4-star hotel. The 5 Studio Suites on the floor 7 also offer breathtaking views over Vienna. The hotel is well located,but we were very disappointed that nobody advised us for the reconstructions taking place. We have made our reservations 2 months ago and for that time nobody contacted us regarding the reconstruction.I work in the travel agency business and it is totally unprofessional to make it this way!This reservation was a gift to our parents for their anniversary during our Vienna_BUdapest trip and we were totally disapointed when we checked in and saw the reconstructions. We have stayed several times at Mercure hotels in Vienna and every time they were perfect..bit not this time. The breakfast was good. Rooms are very nice but needs ventilation i the bathroom. Although the refurbishment of the hotel was ongoing during our stay it had little effect on our comfort. We check in and staff give us upgrade to Suite Room. Very thanks. The hotel was rebuilt and a lot of noise and dust. Good welcome at check-in, room upgrade granted for gold membership. Good and well equipped room, comfortable bed, convenient working desk. The toilet was ok, although a bit small. Unfortunately there was a terrible noise in the room plus some unwanted dust due to renovation works in the hotel. Good breakfast. Price adequate for the service offered. There was no warning on the website or my email confirmation that the hotel was going to be a building site with no spa, no bar etc available. The hallways had black plastic taped to the floor, some rooms blocked off with plastic hordings, holes in the ceilings. The aircon in our room didn't work and the panel was hanging off the wall. The bathroom door looked like it would fall off if you weren't careful. The toilet bowl was cracked all the way around the bottom. We asked for 2 single beds and got one double (lucky we have been friends for most of our lives so just stuck with it, through fear of ending up in a worse room that hadn't been 'refurbed' yet). On our last morning the cleaners started hoovering at 7am then building works (drilling and banging) started just before 9am, RIGHT NEXT TO OUR ROOM. As an accord member I was expecting more, and when we checked in they didn't want my membership number? Not sure if this affects anything or if they had it on the system already. Overall, disappointed and spent as little time as possible in the hotel and opted to go out for breakfast instead of paying to add it. If we had known there were works at the hotel we would have booked somewhere else as there are other accord hotels in the city. Was nice room with an excellent breakfast. 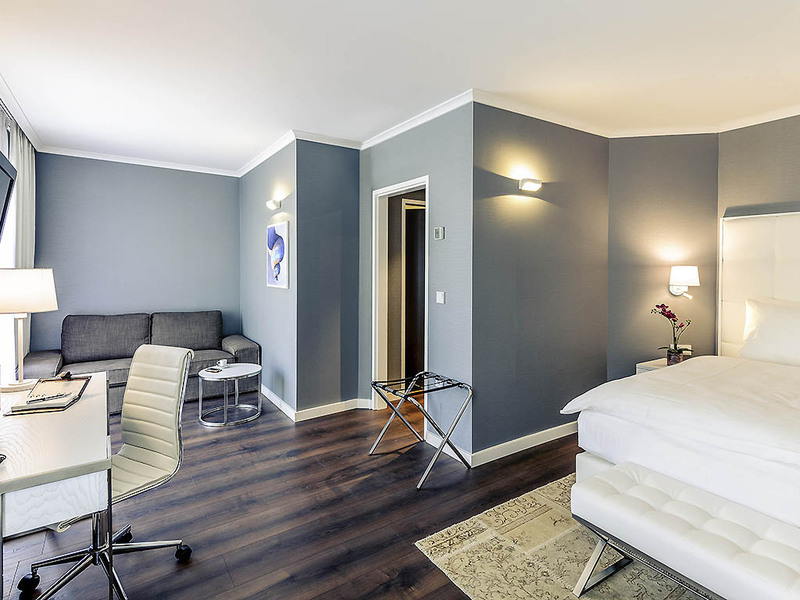 Second time in this hotel, position is good as walking distance from West Bahnhof area (Mariahilfer street, pedestrian area with shops and restaurants). This time some renovation in the parking / elevator going on, not declared on the website... Rooms are nice and not too small. Rooms are good and nicely decorated. Bathroom needs some maintenance, specially on tails, and shower isn’t very good. After a short shower the bathroom floor is all wet. I also think the cleaning should be better. Some hairs found on the bathroom and bedroom floor. I staying 2 nights but the room was quite comfortable & well decorated versus price. The assistance was helpful and everything was smooth. competent and very friendly stuff, present the Hotel with Viennese charm and warm service attidute, we came as a costumer and went as a friend, the car parking will be a few meters at the Ibis Hotel 100m far from Raphael because in the Raphael has very limited parking garage, this will be no problem at all if know the very complecatet parking situation in Vienna! A fairly typical Mercure property. Not in an particularly interesting area, but restaurants are within walking distance. Biggest problem at this hotel is a lack of soundproofing between rooms. This makes it very difficult to get to sleep when people return to nearby rooms late at night, and make a lot of noise. Check-in is extraordinarily slow, it was taking far too long for each guest. The staff is efficient and prompt despite being fully occupied. Loved the breakfast. Well done Mercure! Every thing was on high level. Breakfast,room,service.thanks. The hotel is well situated, not far from the metro station. The main impression is positive, but there are some points, which I would like to touch upon. The beds in the rooms with 2 separate beds are quite narrow. There is no place to spend some time in case of bad weather or in need to meet somebody except for the lobby which is not big and cozy enough. The room was cleaned only upon request to do so. Positive aspects: spacey wardrobe, several restaurants in the proximity of the hotel. Already upon entry the feeling was not welcoming, the reception agent seemed very uninterested in his job. I asked for a quiet room, he Said it was quiet this was not the case at all! When i asked again uninterested reaction, but maybe we could change, when we came back there was a lady at the reception, i asked for change and she replied that she did not speak good english, again als the feeling that guests are a boder, again not friendly or aproachable!?! Do the staff get any training in guests service training i was wondering. Upon check out i mentioned again and again from the Same older gentleman a very blasé answer, and not really possible To have a normaal conversation, at this point he Saïd he had no other rooms at moment of check inn and that was it , why not mention this in the first place at check in? I let it for what it was, but felt very sad About this way of communication. Overall we felt very unwelcome, and because of that we did not have a good weekend, VERY UNHAPPY, i travel al lot also in other Accor mercure hotels , Guest service very below standard. ?